Roasted or toasted, pumpkin seeds are a crunchy fall treat for both you and your dog. You may already be familiar with the benefits of canned or cooked pumpkin for dogs, but don’t dump the seeds. 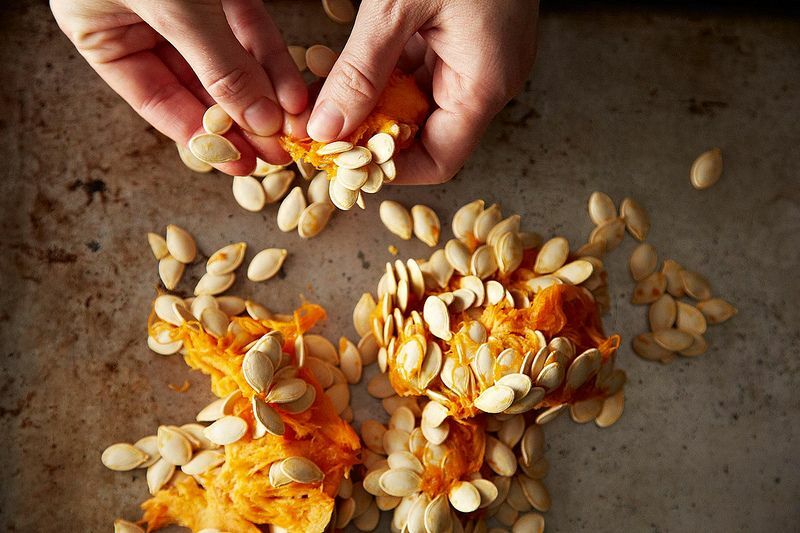 Loaded with fiber and a healthy dose of protein, pumpkin seeds pack a powerful nutritional punch and are delicious to boot. Pumpkin seeds contain about 125 calories per ounce. A serving this size contains 5 grams of fat, 5 grams of protein, and 15 grams of carbohydrates. It also contains a whopping 5 grams of dietary fiber! Pumpkin seeds are incredibly rich in phosphorus and magnesium and contain a significant amount of copper, zinc, calcium, iron, and antioxidants as well. One of the easiest ways to add pumpkin seeds to your dog’s regular diet is to grind them up and add them to his regular meals. You can also bake or roast the seeds whole and offer them to your dog as a healthy snack. If feeding whole seeds, keep an eye on the portions. Only give your dog a few seeds at a time, as the fat content can lead to soft stools or diarrhea when fed in large quantities. And don’t salt the seeds when you roast them! Your dog doesn’t need any extra sodium spooking him this fall.